Howdy, Moz fans, and welcome to another edition of Whiteboard Friday. This week we’re going to chat about how to balance your marketing mix. 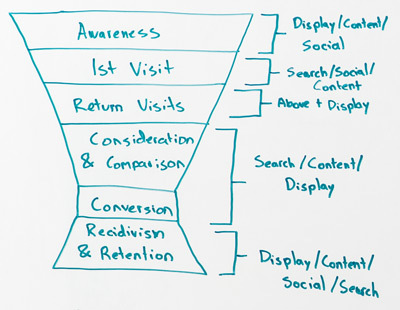 Specifically, I want to talk a little bit more about search ads and SEO versus kind of content and social, those traffic channels that you invest in, either paid or organic, that can drive traffic kind of more at the top of the funnel or more in the conversion process. Determining where your funnel challenges are. Well, guess what? If you’re spending all your marketing dollars on display or on offline forms of display marketing, which go to awareness, and very little in the consideration and comparison set, where things like search can be great, especially your brand versus competitors, or your competitor versus your own brand, or features, or what to buy, or recommendations, or reviews, all those kinds of things, ranking for that stuff, buying those key terms, having content that serves them and maybe doing some display advertising to people who’ve already been to your website through a retargeting that’s trying to convince them, well, all of those forms of marketing can reach that set. But the problem is you’re spending all your time and energy, and people, and dollars up in awareness. I see this across the board. I’ve seen people spend a ton on first visit and return visit, and nothing on recidivism and retention. I’ve seen them spend a ton at the point of conversion, but nothing up here to drive awareness. So they have a great-looking funnel for a very small number of people. If you know where you have this problem, if you can identify where your issues lie, then you can invest in the right channels. You can change up your marketing mix and your people, your time, and your dollars accordingly. Also, don’t be too narrow. My view here is a little bit narrow. But you should consider whether channels like community building, email marketing, offline advertising, or in-product, in-app marketing can actually be part of this mix and how they should be part of this mix. I don’t want you to limit it just to search, social, content, display. There’s a lot of opportunity there. Validate that your investments can actually move the needle. But then, when you actually dig in, you see that you’re not moving the needle on what you need to. You’re not improving the problem that you have in your funnel. You can ask that question in SEO and in PPC as well. Does ranking for this keyword bring in the right qualified potential traffic? Does it bring us enough? Are we ranking for a keyword where, you know what, it sounds like a great keyword and it would convert great. But we’re not getting enough people because Google has a knowledge graph and an instant answer up top. So the keyword opportunity score is way down low in the toilet, and it’s just not going to drive any traffic. So maybe we need to expand that keyword set. Maybe we’re doing great with SEO, but we need to do more of it for different keywords. Analyze your resource allocation to match against the problems and ROI. Now we can say, “You know what? Let me look at my marketing mix. Maybe. Maybe you can. The questions I like to ask in the resource allocation phase are: Are any of these already purely on autopilot? Are they just sort of running and they haven’t been audited? Because that can speak to why the tactic isn’t working, or why it’s not targeting the right phase of the funnel. How many people and hours, not just dollars are going to each? Because a lot of folks, when they look at their marketing budget from a CFO level or a chief marketing officer, they’ll look purely at the numbers, not at the people. That can be very dangerous too, because if you say, “Hey, we’ve got a bunch of our budget is allocated to display. We have almost no budget to allocate it to SEO. But that’s intentional because SEO is a free channel.” Ahh. Pull out your hair. That’s crazy. 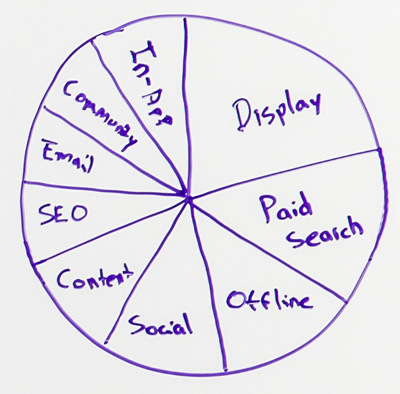 Or the only dollars that we have assigned to it are our SEO consultants, rather than people and hours, and time, and energy, which is what you need to be successful with an inbound marketing flywheel, like the content, search, social, email, community system. Are any of these maxing out? If you’re seeing that you’re putting more dollars, more time against them, but you’re getting lower and lower ROI over time, that could be a sign that you’re sort of maxed out in that channel, and you either need to get more creative on how you’re reaching more people, or you might think about switching some of that expenditure of time and people and dollars. If the answer to those things is yes, then you know what? Data is the place to invest. When you do that, then you’re able to effectively allocate your marketing channels.